SPECIAL SAUCE Musa Awad’s classic Middle Eastern sando is deliciously messy. At D's Diner, Sonoma County's perennial best diner in the Bohemian's Best Of readers poll (they won again this year), you'd expect the burgers to be good. And they are. Mel's Magic Burger (a bacon cheddar cheeseburger) is the top-selling item on the menu. Primus' Les Claypool wrote an ode to D's that praises the Caliente burger. I like the burgers, too, but it's a nontraditional diner item that stands out: the falafel sandwich. Musa Awad has owned D's for 10 years, but only put falafel on the menu five years ago. 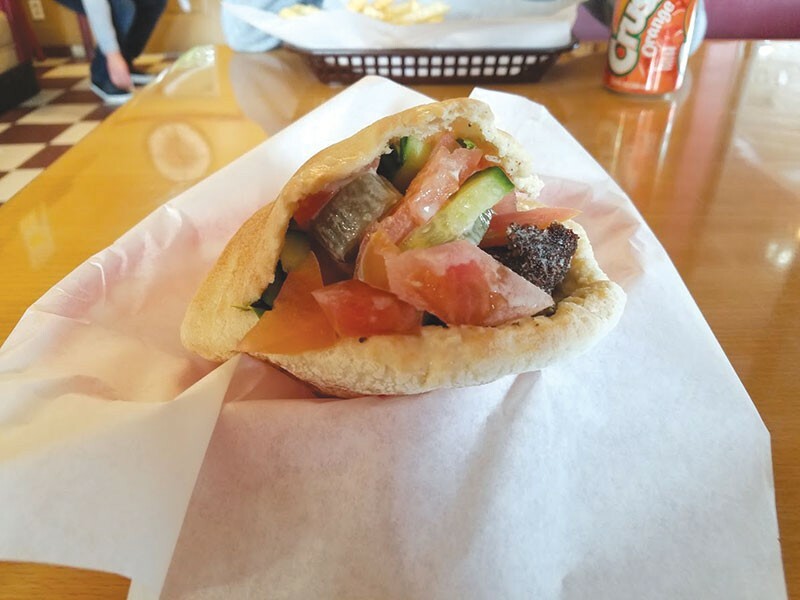 Awad, a Palestinian from Ramallah, understands that American diner fare is his bread and butter and he didn't want to detract from that, but he also wanted to share his passion for falafel. "We wanted to introduce people to our food," Awad says. "It was always my dream to sell falafels. And they just flew. They sell quite a bit." In Palestine, and the Middle East in general, the falafel is the equivalent of the hamburger, everyday food available from street vendors and cafes. There's a debate over who invented the dish. The Israelis and Palestinians both lay claim to it. Awad, as you might guess, credits the Palestinians. "In Palestine, the falafel is very particular," he says. Awad imports a mixture from his hometown that's a blend of ground cumin, coriander, nutmeg and caraway. He stores the mixture in a large, yellow plastic canister that looks like it once held mustard. He holds the container up to his nose and inhales deeply before handing it to his daughter Nadeen and beckoning her to do the same. "What does this smell remind you of?" She takes a whiff of the heady aroma. "Ramallah," she replies, joining him in smile and a faraway look. To make falafel, he adds the spices to garbanzo beans that have soaked in water for 18 hours, then adds fresh parsley, cilantro, jalapeño, garlic and onions, grinds it all up and empties the mixture into a large bowl. "You mix it like you're making pizza dough," says Awad. "You mix it by hand." He says he doesn't have a recipe. He goes by taste and feedback from his family. From there, the batter is formed into balls and fried in oil. Each sandwich ($6.50) gets a generous four balls of falafel. The falafel balls, tahini, hummus, diced tomatoes, cucumbers, thin pickles and lettuce, are stuffed into a commodious pita bread that somehow holds together in spite of the load it carries. The bread is delivered from Jerusalem Bakery, a specialty baker in Sacramento. It's a great sandwich. My only quibble would be the out-of-season tomatoes. They don't add much, and I picked them out. A falafel sandwich should be verging on messy—dripping hummus, tahini and all the condiments. On its own, a falafel is flavorful but rather dry. It needs the creamy richness of hummus and the lemony bite of tahini sauce and pickles to complement it. And that it does. Awad had fond memories of his father bringing falafel home when he was a child. "It was a treat." He makes his falafels with the same affection. "You have to put your heart and soul into it," he says. "Otherwise, it won't taste good." D's Diner, 7260 Healdsburg Ave., Sebastopol. 707.829.8080.